Fort Knox is proud to offer a superior product in terms of quality, craftsmanship, and protection. We are so confident of this fact, that we are the only manufacturer to offer a true comprehensive lifetime warranty. This includes the lock, interior, handle/bolt work, mechanism, clutch, and body of the vault. By adding additional layers of steel you are increasing the tensile strength of the vault, making it stronger and more resistant to attacks. 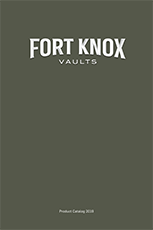 Fort Knox gives you multiple ways to construct your handmade vault to give you the peace of mind you deserve. Limiting the thermal conductivity by lining the inside of our vaults with a proprietary blend of a hydrogen bond fireboard and locking it in place using a stud weld process allows Fort Knox to provide the industry’s leading fire protection. Fort Knox is the only manufacturer that allows you to build a vault to meet your needs; why would the interior be any different. As you create your vault you can choose from an all shelf design, to half long gun storage or all long gun storage.